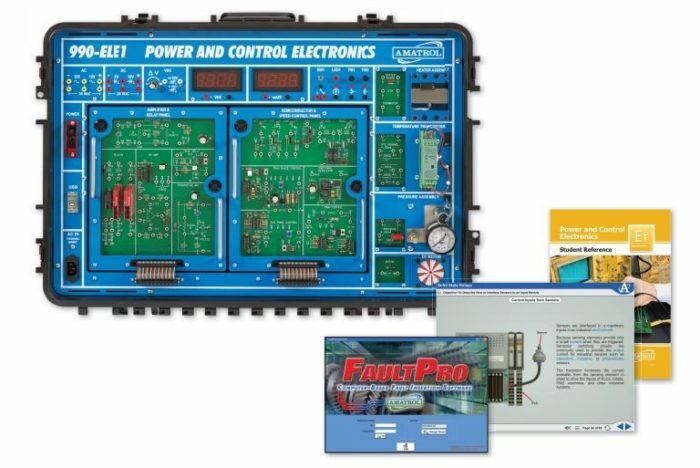 Amatrol’s Portable Power and Control Electronics Learning System (990-ELE1) teaches how to operate, adjust, and troubleshoot electronic components, circuits, and systems used in machine applications. The portable learning system allows for on-the-go exploration of the fundamental concepts of industrial power and control electronics, such as measuring temperature, speed, and analog signals. The 990-ELE1 teaches topics and skills that are invaluable in manufacturing, transportation, energy, construction, and many other industries. The 990-ELE1 features interchangeable application panels with industry-standard components that can be set up in a wide variety of real-world machine applications. These components will help learners gain hands-on experience with linear power supplies, solid state relays, discrete and thermal sensing devices, solid state switching, and more! The 990-ELE1 also utilizes FaultPro, the industry’s premier computer-based fault insertion system, which enables learners to develop key industry troubleshooting skills. FaultPro features 30 different faults to present learners with realistic troubleshooting experiences. The 990-ELE1 with FaultPro allows learners to troubleshoot real-world electronic circuits and components at a system level. For example, the system includes 30 unique faults that present realistic situations that technicians encounter on the job, such as troubleshooting and regulating a power supply, an open-loop operational amplifier circuit, a pressure sensing device, and more! FaultPro’s computer-based faults automatically track progress, enabling learners to gain troubleshooting skills in a self-paced environment that ensures that faults are inserted safely, protecting both learners and equipment. The 990-ELE1 features: a power supply/semiconductor panel with potentiometers and test points; a temperature control panel with thermocouples, resistive temperature detectors, and thermistors; a speed/power control panel; an analog sensor/amplifier panel; and a discrete sensor panel. These industrial-standard components will allow learners to understand how the equipment they’re practicing with will be used to troubleshoot basic industrial circuits. Specifically, learners will perform skills like testing the output of a current limiter, selecting a solid state relay, installing a capacitive proximity sensor, connecting two configurations of open-loop operational amplifier circuits, and designing a circuit that measures the level in a batch process. The 990-ELE1’s in-depth curriculum teaches the concepts of solid state electronics as they apply to modern applications, such as switching power supplies, analog and discrete sensing, solid state relays, transistors, PWM amplifiers, and variable speed motor control. Specifically, learners will study topics like the operation of a full-wave rectifier, the installation of a photoelectric sensor, and testing a triac relay circuit. This curriculum is presented in a highly-interactive, multimedia format that includes stunning 3D graphics and videos, voiceovers of all text, and interactive quizzes and exercises. A sample copy of the Portable Power and Control Electronics Student Reference Guide is also included with the system for your evaluation. Sourced from the system’s curriculum, the Student Reference Guide takes the entire series’ technical content contained in the learning objectives and combines them into one perfectly-bound book. Student Reference Guides supplement this course by providing a condensed, inexpensive reference tool that learners will find invaluable once they finish their training making it the perfect course takeaway.